At a press event today, safer streets advocates highlighted a newly-installed protected pedestrian refuge island and pedestrian-activated flashing signal Albrook Drive in Montbello. All images: Denver Streets Partnership unless otherwise noted. 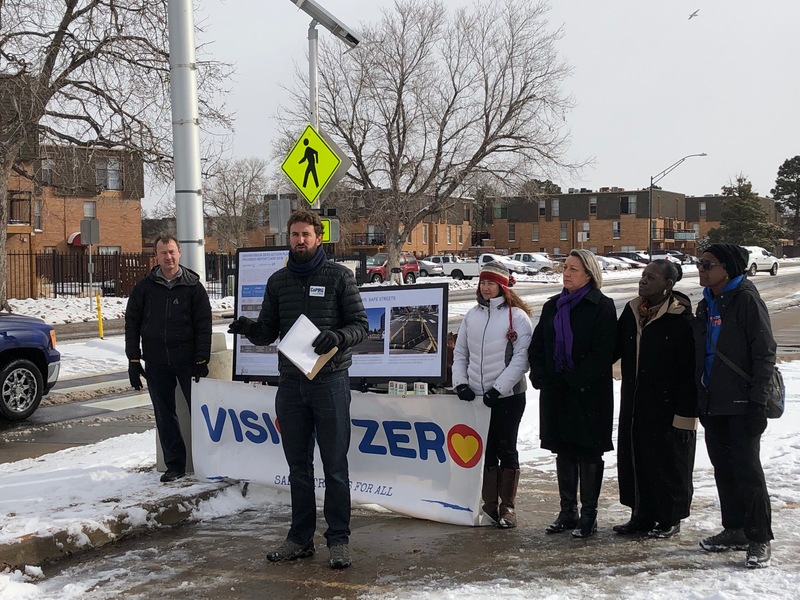 Members of the Denver Streets Partnership unveil its Vision Zero report card this morning. A coalition of safer streets advocates gathered in Denver’s Montbello district this morning to give the city a mediocre grade for its street safety accomplishments last year. The low marks are for city that isn’t following through with all the steps needed to fulfill Mayor Michael Hancock’s promise to eliminate all traffic deaths by 2030, a pledge he signed onto when the city joined the Vision Zero movement in 2017. “We have got to find a way to make pedestrians a priority in our streets,” said Pam Jiner, a leader with Montbello Walks, an organization that is part of the Denver Streets Partnership, which issued the report. The report card comes after the number of people killed on Denver’s streets rose sharply, to 59, last year. Denver’s increasing fatalities run counter to the results in other Vision Zero cities where elected leaders have worked aggressively to make their roads safer. New York City, for example, reduced its traffic fatalities to the to the lowest level since 1910, when horses outnumbered cars, according to Mayor Bill de Blasio. 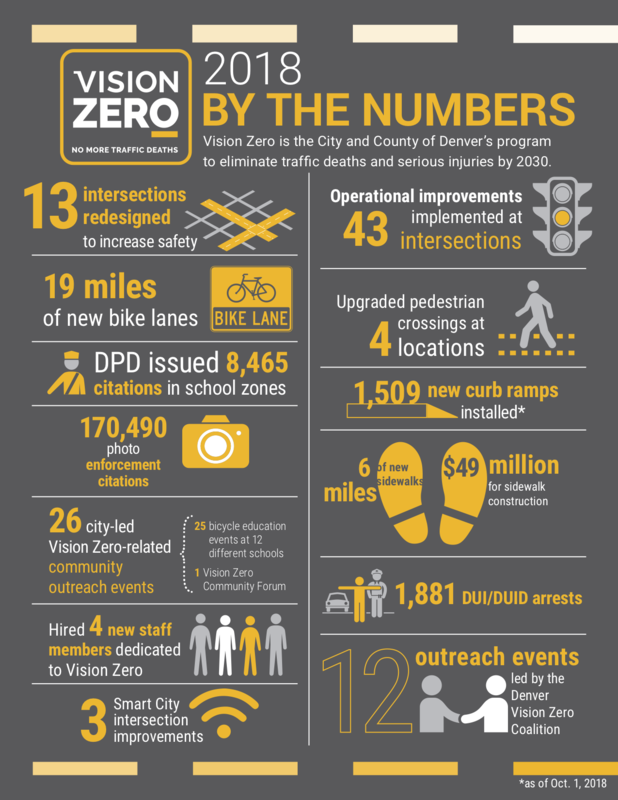 Click here to view the full Denver Vision Zero report card. 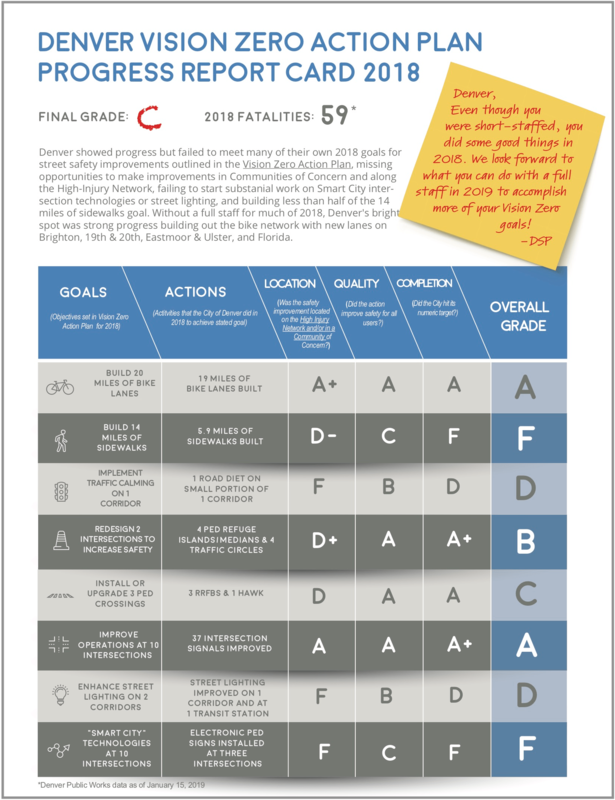 The Denver Streets Partnership created its report card to compare Denver’s five-year Vision Zero Action Plan to a the goals the city said it would achieve last year. While the overall grade is a “C,” the city earned a “D” or “F” on half of the specific steps assessed. There were bright spots, however, including two “A” grades. The city will also have more people and funding dedicated to Vision Zero improvements going forward. Denver earned an “A” for building 19 miles of bike lanes and another for improving the timing of traffic signals to help pedestrians at 37 intersections. The organization awarded a “B” for adding four pedestrian refuge islands and four traffic circles, but the city got dinged for not placing them at locations along the city’s high-injury network. The city earned especially bad grades for its poor choice of where to make its Vision Zero improvements, which often ended up in lower-traffic residential areas. Although the city added or upgraded three pedestrian crossings, it earned a “C” for not installing them on the city’s most dangerous streets. While the city also added traffic-calming and street-lighting improvements, they were not consistently placed on the city’s high-injury network or within vulnerable communities. The city issued this infographic to highlights its Vision Zero accomplishments. Image: Department of Public Works. The city earned two “F” grades, one for building just 5.9 miles of sidewalks compared to the 14 miles it promised. The other was for installing electronic pedestrian signals at only three intersections compared to the 10 it planned. But the report also expressed optimism that the Vision Zero team within the Department of Public Works has four new staff this year. It will also have more money. “Denver, Even though you were short-staffed, you did some good things in 2018,” reads an illustration of a yellow sticky note on the report card. The city will have $49 million to build new sidewalks. With greater resources, advocates will expect more from the city in 2019 — and Eulois Cleckley, the executive director of Denver Public Works, says he’s up for the challenge. Support the nonprofit mission of Streetsblog Denver. Give $5 per month. Context is everything and my grade would be a ‘B’. Design, engineering, budgeting and contracting all take time. There’s $450 million of bonding for transportation projects that were only approved a year ago. These priorities also have to ‘compete’ with other priorities like affordable housing, opiate addiction and the homeless, transit enhancements etc. Very, very little was done, and we had more people killed than the previous year. Permanent solutions take time, but temporary fixes can be made quickly and cheaply in the mean time. Funding needs to be directed to safety above all else first, and it’s not currently. I agree, this is very generous especially the A for bike lanes. I don’t think the new bike lanes made getting around the city by bike particularly safer. And most egregiously, the city repaved half of downtown without adding or upgrading any bike lanes.